And so she did and so it was. The traditional ballad ‘Lady Franklin’s lament’ was sung from the 1850s onwards to the present, commemorating the loss of Sir John Franklin and 129 seamen. They were the ill-fated crews of HMS Erebus and HMS Terror, which searched for the North-West Passage in Arctic waters between the Atlantic and Pacific Oceans. Lady Jane Franklin’s determination to find the missing expedition and the offer of a substantial reward of £20,000 for doing so resulted in a succession of search parties. In 1847, under pressure from the press and Lady Franklin, the Admiralty launched a major search from three directions. One, led by Admiral John Ross, was by sea through the Canadian Arctic Archipelago; another led by Sir John Richardson and John Rae went down the MacKenzie River to the Canadian Arctic coast and the third was by sea from the Pacific through the Bering Strait. In 1848, the Pacific approach was led by Henry Kellett, captain of HMS Herald, which had been surveying the Pacific coast of North America. On May 9th the Herald left Panama and sailed north through the Bering Strait, reaching Kotzebue Sound, Alaska on September 14. Whilst waiting for its depot ship HMS Plover to arrive, Kellett took the opportunity to explore the nearby frozen ice cliffs of Eschscholtz Bay. Kellett and his naturalist, the German-born Berthold Seemann were aware that decades earlier, in 1816, a Russian expedition led by Captain Kotzebue had discovered what became Kotzebue Sound and the fossil bearing ice cliffs of Eschscholtz Bay, named after Kotzebue’s naturalist Johann von Eschscholtz. The puzzling nature of the ice cliffs had also been investigated in 1826 by a British naval expedition led by Captain Frederick Beechey. Again bones of large animals were found and further observations made about the mysterious ice cliffs. Whilst Kellett did not find any trace of Franklin, he too found a spectacular cache of 8 large and well preserved mammoth tusks along with other bones. During the brief summer thaw the surface of the ice cliffs melts, exposing occasional animal remains, which had been frozen and preserved in the mud and silt deposits formed during the Ice Age. As Berthold Seemann later wrote in his published Narrative of the Voyage of H.M.S. Herald … ‘In 1848 we collected eight tusks of the antediluvian elephant, the largest of which, though broken at the point, was eleven feet six inches long, one foot nine inches in circumference at the base, and weighed 243 lbs. The tusks were accompanied by molar teeth, thigh bones, ribs, and … a great number of … bones, were disinterred.’ Altogether, extinct species of mammoth, horse, musk ox and bison were found along with those of living moose and reindeer species. Seemann’s account included comments by the Scottish surgeon and naturalist Sir John Richardson who, along with John Rae, had navigated the Mackenzie River in search of Franklin. Richardson wrote that ‘The animals whose osseus remains now engage our attention ranged while living to the shore of an icy sea, and that by some sudden deluge …were swept from their pasture grounds ….we have evidence of diluvial action extending from the ultima Thule of the American polar sea so far southwards in the valley of the Mississippi.’ This was the common explanation given at the time and was little more than a version of the biblical Flood story. Within a decade or so there was a revolution in thinking about the antediluvian animals and deposits, which are so common across the landscapes of North America, northern Europe and Asia. A Swiss geologist Louis Agassiz, who had first hand experience of the effects of glaciation in the Swiss Alps, persuaded British geologists, such as Adam Sedgwick in Cambridge and William Buckland in Oxford, that many features of upland Britain were the result of the action of ice rather than flood waters. The ice cliffs of Eschscholtz Bay and their fossil bones, including Captain Kellett’s mammoth tusk, can now be seen as evidence for changing climate within the Ice Age. With lowered sealevels during cold glacials, Asia was connected to North America across the Bering Strait. And, when climates permitted, huge numbers of animals migrated back and forth across this landbridge. At times their populations in Alaska were also decimated by phases of intense cold when their remains became incorporated into the freezing deposits of the permafrost. Much of that permafrost remains today but is being thawed out by today’s rising temperatures. Missing the connection with their supply ship HMS Plover and with winter approaching Captain Kellett was unable to pursue his search for Franklin. HMS Heritage returned to England via Hawaii, Hong Kong and South Africa. They arrived back in June 1851 and Captain Kellett dispersed his wonderful finds from the ice cliffs of Eschscholtz Bay to various museums including the Sedgwick Museum in Cambridge. 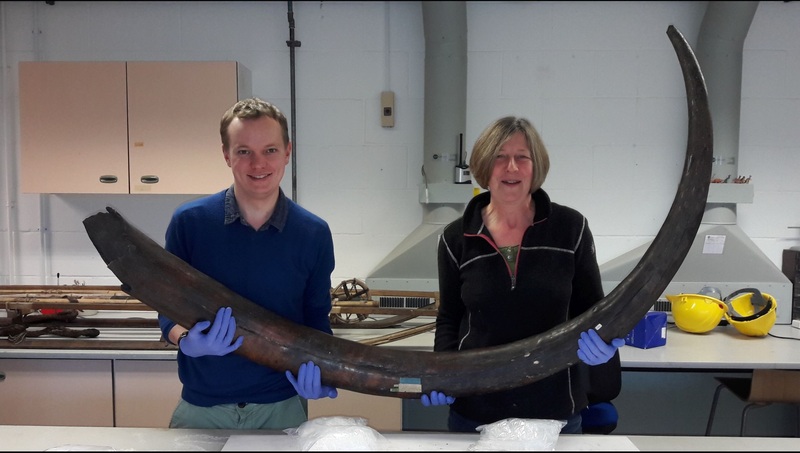 The tusk is now on display as part of the Museum’s new exhibit on the ‘Ice Age’. Eventually, thanks to the combined efforts of the Canadian Coast Guard, Ice Service, Navy, the Government of Nanavut and Parks Canada along with modern technology, such as sonar and remotely operated vehicles, the wreck of Franklin’s ship, HMS Erebus was found in 2014 in Victoria Strait offshore from King William Island in the Canadian Arctic Archipelago. Two years later the consortium found HMS Terror some distance away in Terror Bay. Divers have recovered large numbers of artefacts, which are now being conserved at a new research facility on King William Island.